The former Yugoslav regime elements and their children spearheaded subversive activities against the facts, Croatia, and Bosnia and Herzegovina (B&H) Croats from the 1990s, through to today. While overtly Yugoslav nationalist in their rhetoric, still to today expending taxpayer resources celebrating the Communist “liberation” and 1945 Partisan (private property) “liberators” of Croatia, they were the first to declare any opponents of their sham anti-war agenda as “nationalist,” “primitive nationalists,” etc. – blaming “nationalists” on “both sides” for the war, and not the marriage of greater Serbian fascism and retrograde Yugoslav Communist Titoism and the detailed Serbian General Officers plan for aggression, beginning with the reorganization of Territorial Defense in the mid 1980s, through to the ‘Yogurt Revolution,’ trampling of the SFRY Constitution, quasi-legal attempt at Kosovizing Croatia and the rest of then Yugoslavia, and of course the Rampart (RAM) Plan, with the explicit order to target civilians to demoralize ‘enemies,’ and overtly stated goal of creating a Greater Serbia at the expense of most of Croatia and the whole of B&H, with access to Croatia’s coastline. 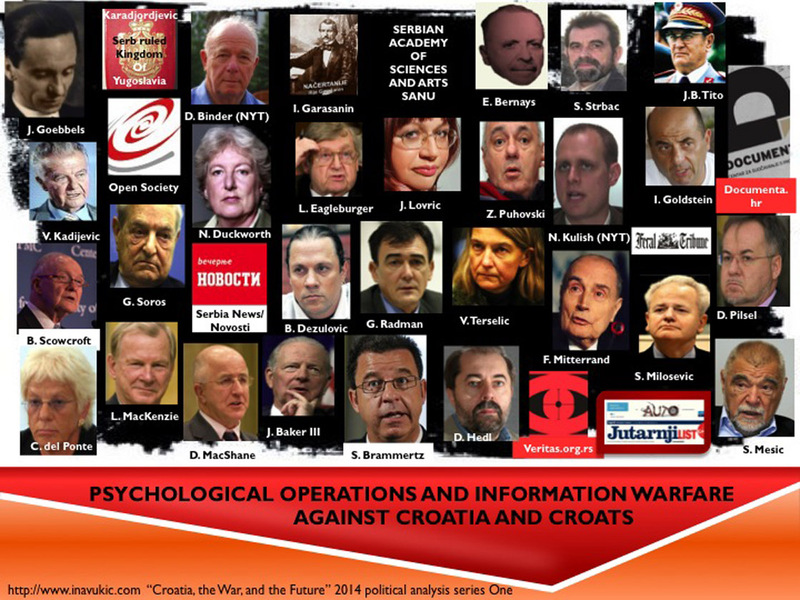 Among the more vocal propagandists in the front of the charge was none other than Croatia’s current Minister of Foreign Affairs, and unofficial Shadow Foreign Minister of Serbia, Vesna Pusic, sister of UJDI (Association for Yugoslav Democratic Initiative) co-founder and current GOLJP head (Citizens Committee for Human Rights), Zoran Pusic. Vesna Pusic helped form Erasmus Gilda in 1993, a declaratively pro-European organization, along with Slavko Goldstein, and other post-1990 self-styled “human rights” activists (the systematic violations of human rights before 1990 was apparently not a problem to them as they were silent and remain silent about them) and disinformation luminaries who all just happened to be against Yugoslavia joining the European Community prior to the first free elections in 1990, because the EC was a free market economy. Along with the previously mentioned outlets like Arkazin, Feral Tribune and others regurgitating Belgrade’s propaganda on a weekly basis, Erasmus gatherings, published articles and their eventual failed magazine that generous USAID funds could not save, touted the line and gave the anti-fact agenda political legitimacy as they included many academics who rose to prominence within Tito’s Yugoslavia. Here was yet another case of foreign aid subsidizing another controlled opposition – who foreign governments would openly put into power in 2000, and again in 2011. Thwart any meaningful investment with bizarre regulations, a monstrous tax code, bureaucracy, and torpedo any business investment, including sweet-heart deals, at the strategic and state level through incompetence if they conflict with Anglo-American business or geopolitical interests (see the Qatar debacle). About the author: Ante Horvat was born in the USA in 1970′s. He has recently moved to live permanently in Croatia and although spending most of his life in the USA he had made several temporary residence visits to Croatia during that time. His education and professional development in history and international relations also spans across the two continents. He is an active observer of and participant in the development of democracy in Croatia since the early 1990’s and its correlation with the developed Western democracies. Part VI – The next installment will look the new and subtle English-language information warfare against Croatia, subsidized by allies no less. I just happened to stumble across this and it reminded me psy-ops, with the Daffy Duck character representing the quality of US foreign policy; and Bugs being any non-Third World country. I ended up turning it into a blog post called “Daffy Duck, US Foreign Policy Expert.” On one of my hard-drives, I have an account of the CIA’s initial activities in Afghanistan. It is from a documentary I watched on a program called Frontline, using the CIA’s own footage of the events. It’s absolutely astonishing how a group such as that is trusted with representing the US and detaining and “interrogating” suspects. The footage ends up looking like a chronicle of a group of people determined to have themselves killed off in the most idiotic ways over the course of a few days. Trusting a few for important tasks can have dire and sad consequences for all sides, Donald.